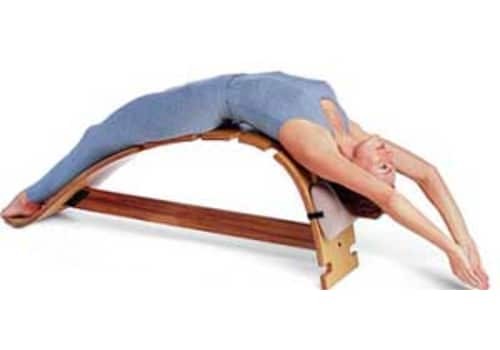 The Whale Therapeutic Back Bench, which derives its name from its elegantly curved profile, is a multi use tool designed to stretch and elongate the spine while rejuvenating and energizing the entire body! Whether working at a desk all day or performing some physical task for a living, we are constantly required to bend or hunch forward. After a number of years, this forced posture begins to take its toll on the back, particularly the spinal column. The muscles become tight, the spine begins to lose its graceful S-curve and instead becomes rounded or humped. Sound familiar? The Whale provides a way to counteract these problems. By positioning oneself in a gentle back bend, the spine is stretched in a way opposite to that required by normal everyday activities, thus reversing the tendency toward forward rounding. Since the weight of the upper and lower body act in opposite directions in the raised back bend position, a traction effect is achieved which elongates the spine. The combination of these two actions, called extension, greatly reduces vertebrae and disc compression and often relieves associated pain and discomfort as well as improving ones appearance. By moving up or down the gradually increasing curve, one can effectively control the intensity of the stretch while the vulnerable lower back is protected from over extension by the flatter portion of the bench. An adjustable neck and head rest provides those who need it the additional support required for this area and is removable for those who do not. If preferred, this headrest may be placed under the lumbar (lower) spine instead. These features allow The Whale to be used by people with a wide range of flexibility. If desired, The Whale also provides for a series of complementary stretches as shown in the accompanying photos. For instance, when finishing a backbend, one can slide into a chest and shoulder opening stretch followed by a forward bend. Each posture releases and stretches different joints and muscles, allowing a whole routine to be developed on The Whale. An added bonus of using The Whale is the energizing and rejuvenating effects produced. By extending the spine, releasing tightly held muscles, and increasing blood flow to the brain, The Whale often increases ones personal sense of well being. Some people even report having less trouble sleeping with regular usage. The Whale is handcrafted from beautiful hardwoods using a bending and laminating process which results in a light weight yet sturdy design. At only 1'W x 2'H x 5'L and a mere 20 lbs., The Whale takes up very little space and can be moved most easily. It adds warmth to any environment and is attractive enough to be displayed as fine furniture in the home. Comes fully assembled with instructions for use and a 1 year warranty.